Calling all theater lovers! You do not want to miss the Waterworks Players production of Christopher Durang’s Vanya and Sonia and Masha and Spike. If this play is new to you, the catchy title provides just a hint of the originality and fun that await discovery. This production is community theater at its best and showcases the talent, energy and creativity we’ve come to expect of the Waterworks Players. And once again they have delivered a wonderful evening of entertainment. The play, which premiered in September 2012 at the McCarter Theatre in Princeton, New Jersey, won both the Tony Award for Best Play and the Drama Desk Award for Outstanding Play in 2013. Critics have praised the unique way in which the author blends a modern story with creative references to Chekhov as well as elements of classical Greek theater. This is a story about the complex, delicate nature of relationships and the power they have to make or break us. 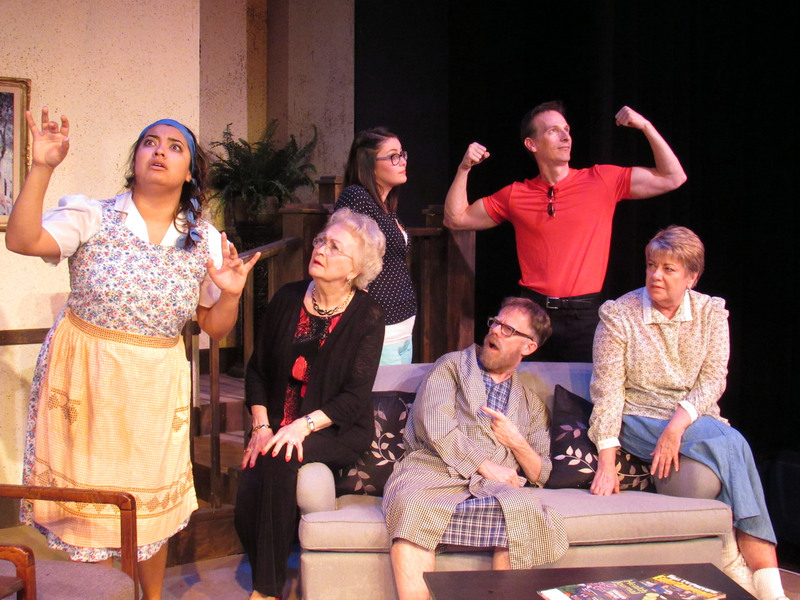 Durang has created six distinct characters, each of whom is a significant part of the overall structure of the play and each fulfills an important part of the work. Like a pie that’s been sliced into six pieces, the play would be incomplete without one of the characters. The play begins with two middle-aged siblings awaiting the arrival of a third sibling. Adult children of professor parents who loved Chekhov and community theater, Sonia and Vanya still live in the family home, where they cared for their aging parents who have since passed away. The audience learns that they depend financially on their sister Masha, a famous actress, and because of the nature of the relationship, there is a fascinating mixture of resentment and love. When Masha comes home with her new and very young boyfriend Spike, she tells her brother and sister she’s going to sell the house. The cleaning woman, Cassandra and the young, beautiful Nina from next door are pulled into the action and from that moment the plot spins in unexpected directions that provide a great evening of entertainment. Dudley Sauve, the director, has put together a strong cast. Martha Womack and Ed Kinman deliver strong, sensitive portrayals as Sonia and Vanya, with the delightful Daphne Mason as their charming and overbearing older sister Masha. The audience can’t help but be entertained by the energy and fun that Greg Tsigaridas brings to the role of Spike and kudos to Miriam Loya (Cassandra) and Caitlin Mazura (Nina) for the spark and life they bring to the stage. Mazura is absolutely charming as Nina, while Loya’s interpretation of Cassandra is not to be missed. Local teachers won’t want to miss the opportunity to show their classes a modern, very humorous portrayal of the prophetic Cassandra. Both the costumes and the set are visually pleasing and it is clear that the Waterworks Players have worked tirelessly on this production and with great attention to detail. It’s a good idea to get your tickets now. Show times are Thursday and Friday, October 14 and 15 at 8:00 p.m. and again the next week October 21 and 22. Tickets are $12.00 and may be purchased online at this site.